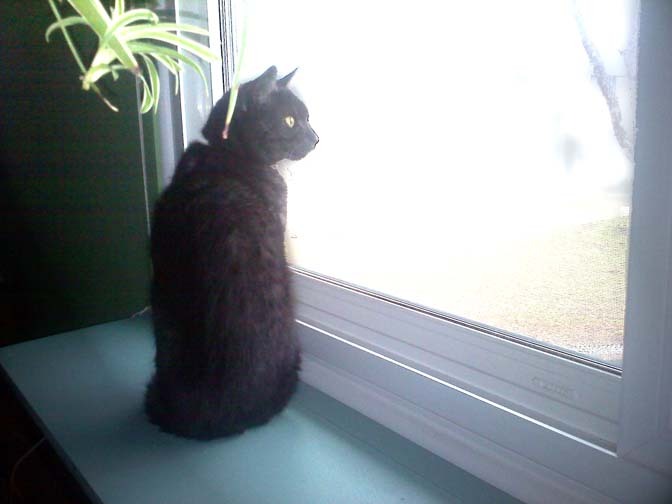 Upstairs cat enjoys the new view. I have definitely slowed down at getting rid of things. Craigslist has been slow the past couple of weeks (last thing I sold was a hand-held vacuum cleaner for $15), and I haven’t posted to Ebay in a few weeks, since what I’ve got left is mostly low-value and not worth making a trip to the post office is I sell only one or two. I’ve started planning for the neighborhood garage sale, which doesn’t happen for a couple months, and have a small pile for St. Vinny’s. I have, however, made progress in converting piles of stuff into things with a function and purpose. I finally lined one closet wall in the second bedroom with the cedar planks I’ve had lying around for two or three years. Yesterday, I transformed some of the scrap wood pile into supports for a flexible duct that will keep the front basement room a little warmer in winter, and hung the duct up, meaning it’s no longer taking up a corner of the laundry room. This means that I’ll be able to close the door between the basement front and back rooms, so I won’t have to put away every piece of a sewing project whenever I step away from it (to keep it from thread-predatory cats). I built two hinged shelves under my bedroom window out of a huge piece of plywood I found on the curb last summer, so upstairs cat can gaze out at the birdies – they’re hinged so I can fold them out of the way when I want to open the closet door, which is actually pretty rare (it’s a second closet). I hung another two carpeted cat shelves (gifts from a friend) in the upstairs hallway; upstairs cat has not yet deemed them to be acceptable perches. 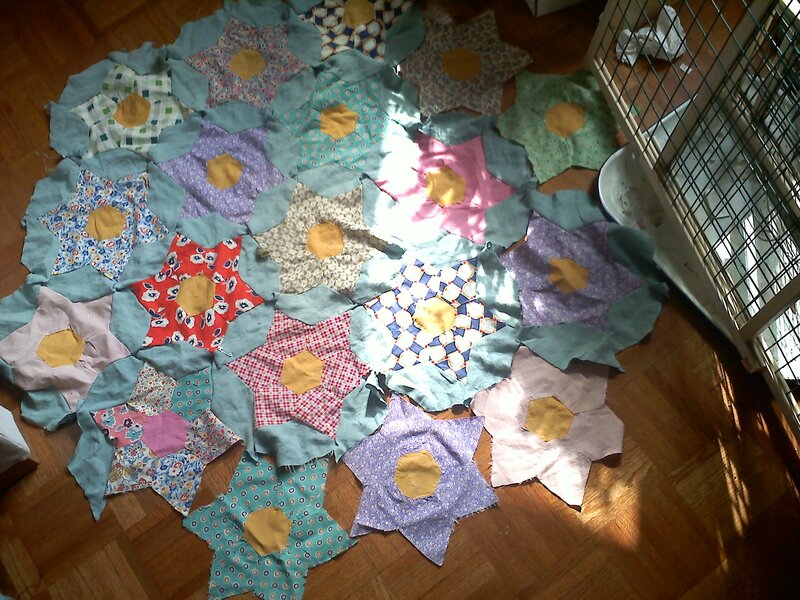 After two years, I am done with the major part of piecing together a hexagonal quilt from stars that were probably sewn by my grandmother or greatgrandmother (they were found in my grandmother’s sewing room). The quilt before I finished piecing it. I didn’t realize how much I’d gotten done until I wrote it all down. I’ve impressed myself. And I didn’t even mention that I had a good freelance gig all the while. On the thrifty side, I received in the mail this week 7 servings of instant coffee; a Neutrogena Naturals lip balm; travel-sized shampoo and lotion; sample packets of shampoo, conditioner, suncreen, face lotion and face soap; a tiny amount of zit lotion that should last me the next year; and a couple of Prilosec. I signed up for these via various freebies sites. I strive to control myself and request only what I will use, but unfortunately the hair people often want to send you conditioner with shampoo, even if you don’t use it. Thank goodness my roommate uses conditioner, and if I’ve got too much for her, then there’s always St. Vinny’s. Running errands with Dekalb this afternoon. He had me print out PowerBar buy-one-get-one coupons so he can stack them with the 10-for-$10 at Hyvee today. Will probably also stop by the Petsmart for free cat litter and food, and stack a manufacturer’s and store coupon for $12 off upstairs cat’s new prescription food, which will still be ridiculously expensive. Also plan to stack coupons for free Skittles for the boyfriend, free Aveeno lotion for me, and free M&Ms for whomever I feel favorable toward. I could get four Oil of Olay soap bars for $0.63 each, but haven’t decided yet if it’s worth it. I would be able to get it down to $0.13 each if I had two Sunday circulars, but I’ve only got the one.